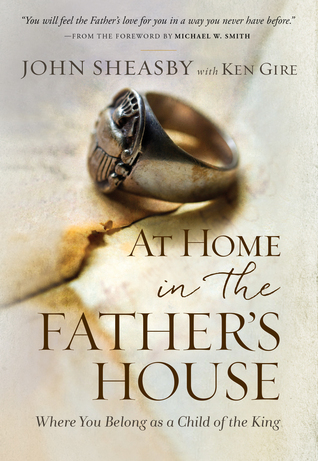 Ladies and gentlemen, I am pleased and honored to write a review on John Sheasby's "At Home in the Father's House: Where I Belong as a Child of the King". This is one of those volumes where the material hits the reader right between the eyes with Truth. In the Kingdom, there are Sonship and Servanthood. In Biblical times, individuals received their blessings in two distinct ways. They received them as the blessings were "earned" or when the blessings were "inherited". Through relationship as with a blood heir, or through transaction, as through a hired hand or servant. Using distinct Biblical examples, author Sheasby opens his heart to engage the reader to open his heart and eyes to the magnificent blessings that are available through a familial relationship with the King of Kings. Repeated examples, both from the author's life and through clear biblical illustrations, Sheasby endeavors to show us what we miss if our relationship with God is not up to its potential. These illustrations become obvious as the reader meditates on the content of this fine book. I am always happy and willing to discuss book content and story lines. I try to avoid getting too "chatty" during a book review, as I want to let the potential reader of this book to experience the same kind of revelation as I did upon reading the book. In that regard, therefore, I offer my complete and total recommendation of this book to you, the reader. I want you to engage with Pastor Sheasby in a "spoiler-free" experience. And I hope that the reader's experience is similar to my own, as your heart and mind are confronted by a new way of looking at where we belong as children, rather than servants, of the King. As a result, I give this volume 5 big gold stars, and back that with my heartiest recommendation as a book that will serve you unexpected blessings from completely new perspectives. This is one of those books that sneak into the scene and then suddenly break out as readers grasp the weight and truth of the message. And this is a message of Truth, Victory, and Abundant Blessing!I received a copy of this book as an Advanced Reader's Copy from the publisher in exchange for an honest and timely review. There are no other connections or expectations between myself, the publisher or the author. This review will be included on Goodreads.com, Amazon.com, my blog: jonreviewsbooks1.wordpress.com, and other social media sites. Happy reading! "You cannot give what you have not received." With this simple sentence, first heard in July 1995, the author shows the need of receiving the love of HaShem as our heavenly father. Without it, we are left only with the love, or lack thereof, experienced here on earth. Some parents did well and others not so much, but those lessons are passed on to the children, who then become parents themselves. Thus the need for heavenly love. Sheasby writes from the experience of his father's struggle with love toward him as a child and how that expressed itself in his own fathership. This book has a dual focus: tell the story on the transformation in the author's own life on how he learned to connect with G-d, and teach it as a similar opportunity for others. Sheasby's prose is easy to follow, allowing the reader to engage personally in the material. He tells his tale with vivid imagery and descriptive text, helping the reader visualize events and compare it to the author's own journey. His tales are all too familiar to a modern generation - tales that I have typically heard coming from Catholic upbringings. Readers will enjoy his ability to craft words and give inspiration. The title is best suited for those seeking more of a father relationship with G-d as Father, and is a good place to start that journey. Disclosure: I have received a reviewer copy and/or payment in exchange for an honest review of the product mentioned in this post. John Sheasby Ken Gire - John Sheasby is an evangelist and teacher from South Africa who now resides in Bixby, Oklahoma, where he leads Liberated Living Ministries. He is an in-demand speaker internationally and a frequent guest at Michael W. Smith events throughout the year.